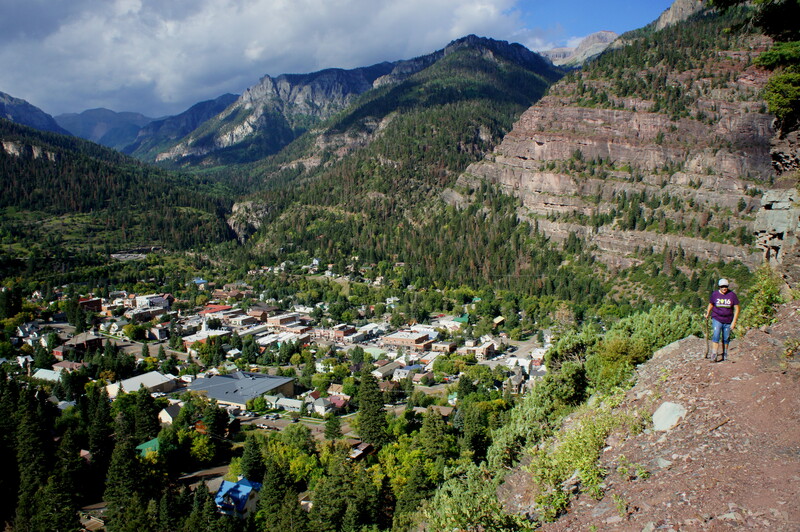 The Ouray Perimeter Trail, as the name suggests, forms a circuit around the picturesque town of Ouray in southwest Colorado. 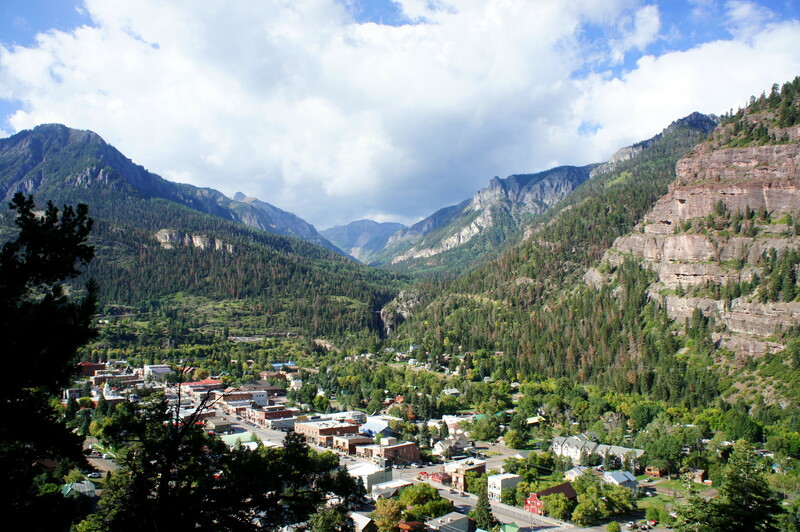 Far from being an easy city walk, however, this rugged track traverses high ledges, crosses deep canyons, and passes waterfalls and rocky outcrops in a half-day hike that offers vistas of Ouray from all sides. The route described below cheats ever-so-slightly, as it includes a shortcut on the Ice Park Trail to shave off around 8/10 mile. 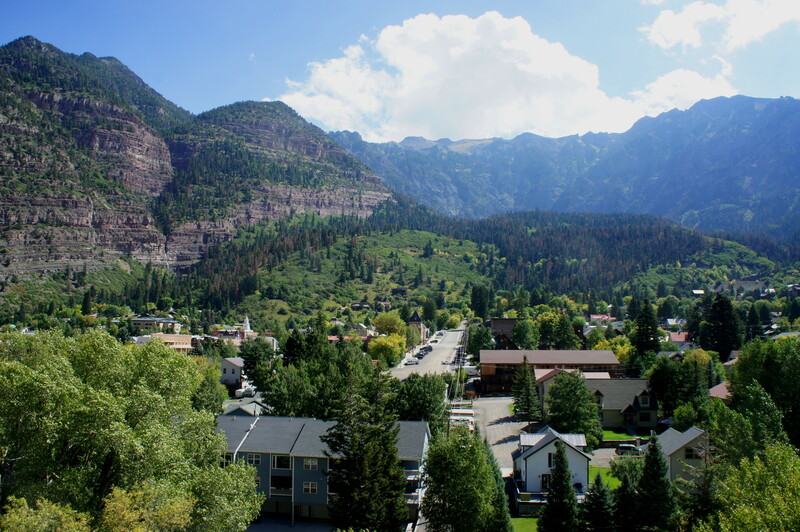 There are numerous options for accessing the Ouray Perimeter Trail but there is probably no better place to start than the Ouray Visitor’s Center and Hot Springs, situated just north of town. Park at the visitor center, then cross Route 550—which doubles as Main Street—to reach the start of the clockwise circuit. Here you’ll find a sign marking the Ouray Perimeter Trail, which has been stitched together in the past decade from a patchwork of existing trails. The flat, wide path at the start quickly gives way to a staircase and a sharp climb. As the condominiums off to the left disappear, the trail gains more than 200 feet over the course of three switchbacks, then levels off at around ¼ mile. 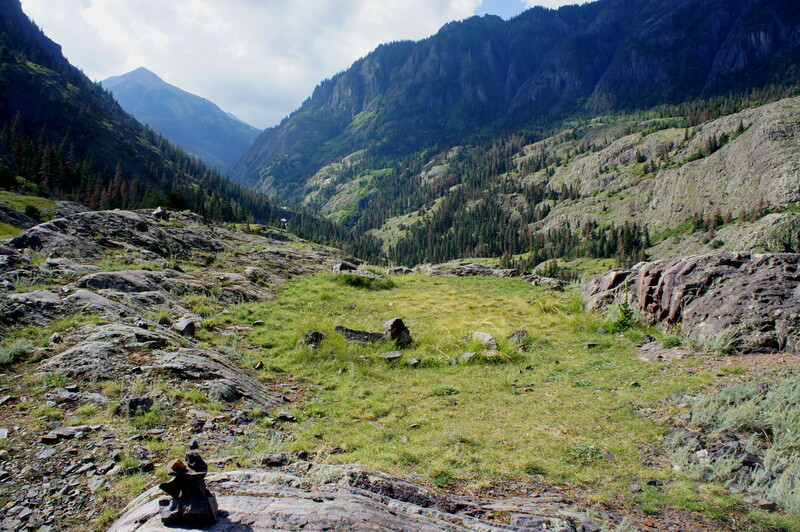 Hugging the side of Cascade Mountain, the path rounds a left-hand bend, crosses a rock slide, and affords excellent views of Ouray, Hayden Mountain (13,206’), and Canyon Creek Valley. 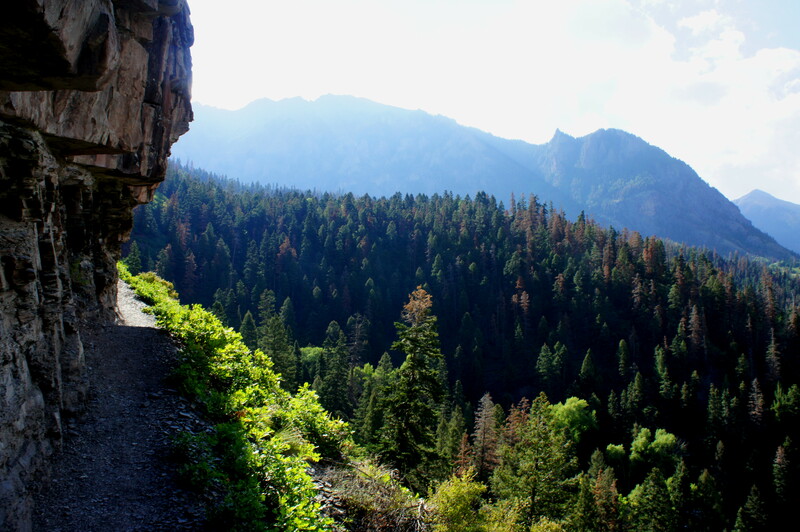 At around ½ mile, the trail traverses a thin shelf above a sheer drop-off; while not as daunting as the nearby Bear Creek Trail, the exposure is sure to spook those with a fear of heights. 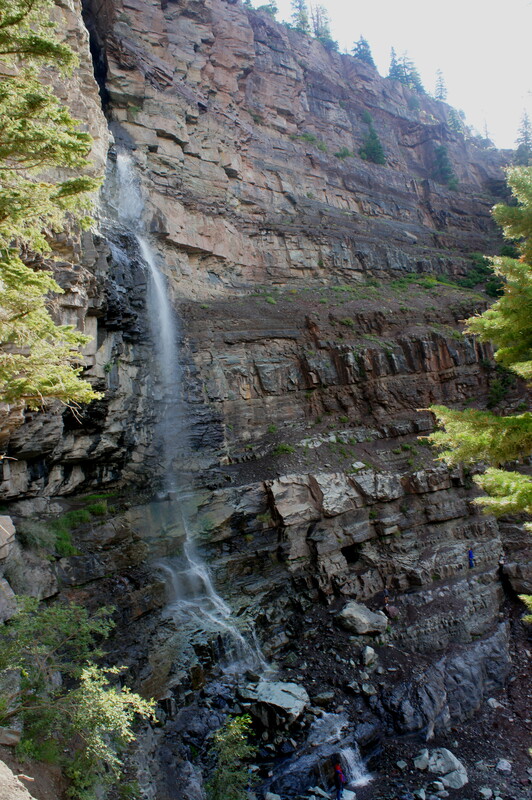 Nonetheless, the most intimidating section is less than 1/10 mile, and the steep incline on the right gradually diminishes as the Ouray Perimeter Trail approaches Lower Cascade Falls. At around 7/10 mile, with the falls visible on the left, the path drops sharply to meet Cascade Creek. Follow the signs for the Perimeter Trail as it descends through the shady gully and crosses the stream at ¾ mile. 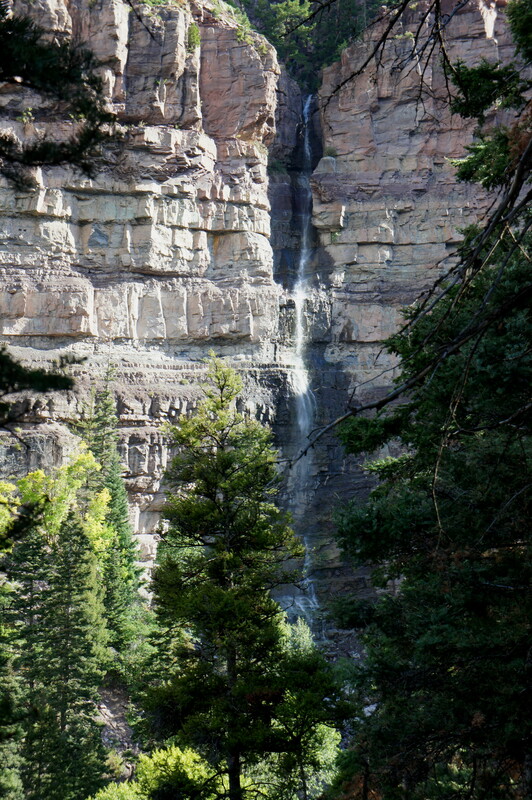 Look for the continuation of the trail along the east bank; stay left on the trail—the wider and well-trafficked Lower Cascade Falls Trail heads right to 8th Avenue in Ouray. Beyond the waterfall, the trail climbs up a woody hillside, a sharp contrast from the blocky cliffs that characterized the first ascent. Here the trail passes below the Amphitheater Campground area, situated atop a shady plateau; a spur trail at 0.95 miles provides access to the campground. Staying right at the fork, the Perimeter track runs through a sea of brushy scrub oak and lofty pines and passes a second trail junction at 1.1 miles. The gradual ascent ends at 1.3 miles, where the path empties out onto the paved Amphitheater Campground Road. Take a right, following the road for 1/10 mile, until the small but marked Baby Bathtubs Trailhead appears on the left. Here the Ouray Perimeter Trail traces the old Baby Bathtub hike upstream through one of the circuit’s most interesting sections. 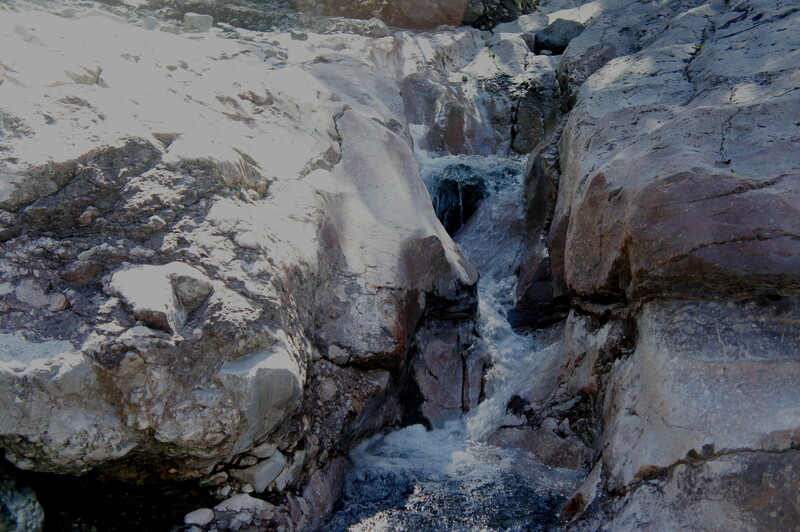 After an initial climb, the narrow footpath approaches an undulating ravine where water has carved smooth curves in the granite bedrock. After crossing the stream, the trail climbs to the rim of a second, deeper slot canyon with walls reaching as high as 40-50 feet. 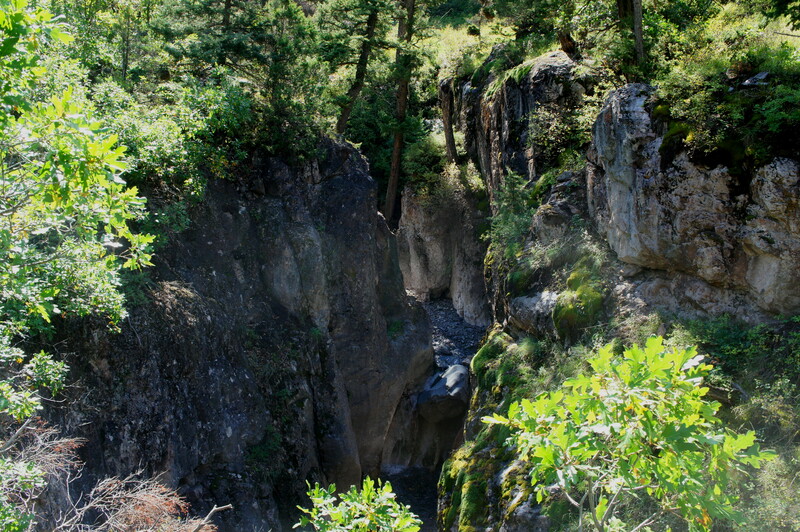 Numerous vantage points offer views of the canyon as well as the Baby Bathtubs area’s namesake bowls, one of which is easily reached as the trail comes level with Portland Creek above a winding chute at around 1.6 miles. In around 150 yards, the trail forks; stay right, then cross a wooden bridge to clear the stream. Cutting back to the west, the trail hugs the southern flank of Portland Creek then splits once more: bear left on the Ouray Perimeter Trail, which climbs abruptly up a grassy slope. Pass what appears to be an abandoned campground on the right at 1.7 miles, then bear left (uphill) on the graveled Portland Road at 1.9 miles. 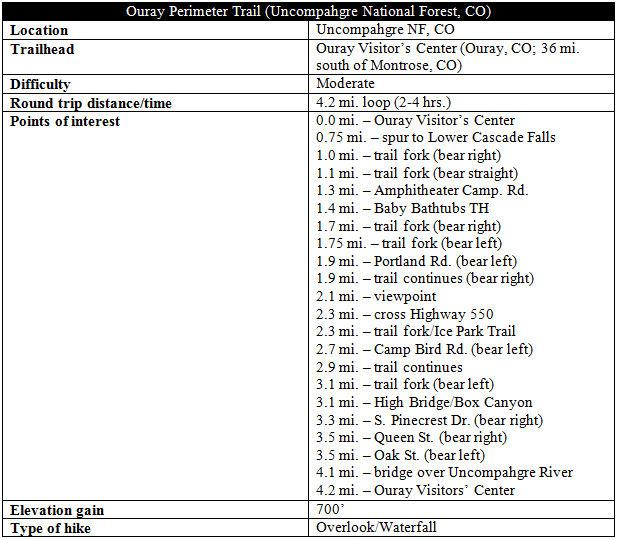 After 100 yards, look for continuation of the Ouray Perimeter Trail, which returns to a singletrack, off to the right. 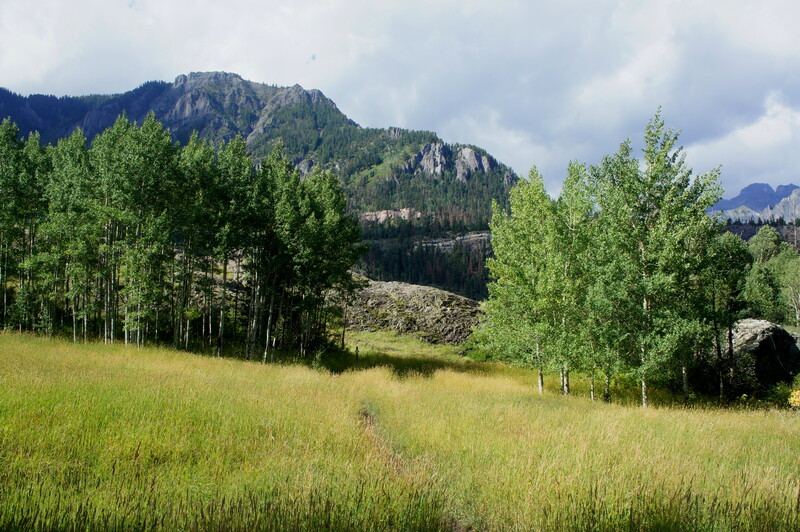 Cresting a small slope, the trail here crosses a beautiful meadow flanked with aspens. 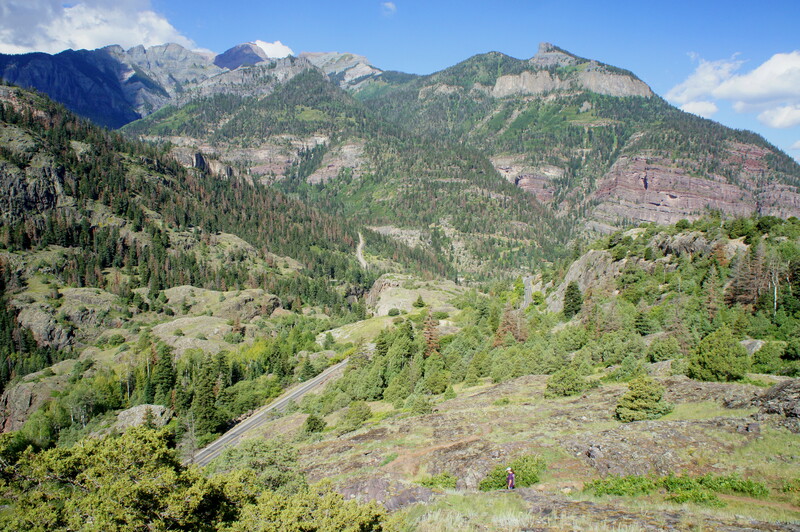 The flat fields soon give way to rocky outcrops as the Ouray Perimeter Trail crests ascends to an excellent, unmarked viewpoint at 2.1 miles. Here Uncompahgre Gorge and Abrams Mountain (12,801’) emerge to the south as volcanic rock dots the ridgeline in the foreground. Looking back northwest to Ouray, Twin Peaks (10,798’) and Whitehouse Mountain (13,492’) are in full view. Completing the picture are the multihued cliffs of the Cascade Mountain behemoth to the north and east. The Ice Park Trail passes the grounds of the annual Ice Festival, held in January, when ice climbers from all over descend on Ouray to try their luck with picks and cramps in Uncompahgre Gorge. By contrast, in summer, the area comprises flowering fields, rocky balds, and sporadic conifer groves that are largely quiet. Ever downhill, the Ice Park Trail drops gradually, with one final steep push, to meet Camp Bird Road at 2.7 miles. From here, take a left, crossing the road bridge over Uncompahgre Gorge, a curvy canyon fed in part by a rerouted waterfall that comes in from to the right. 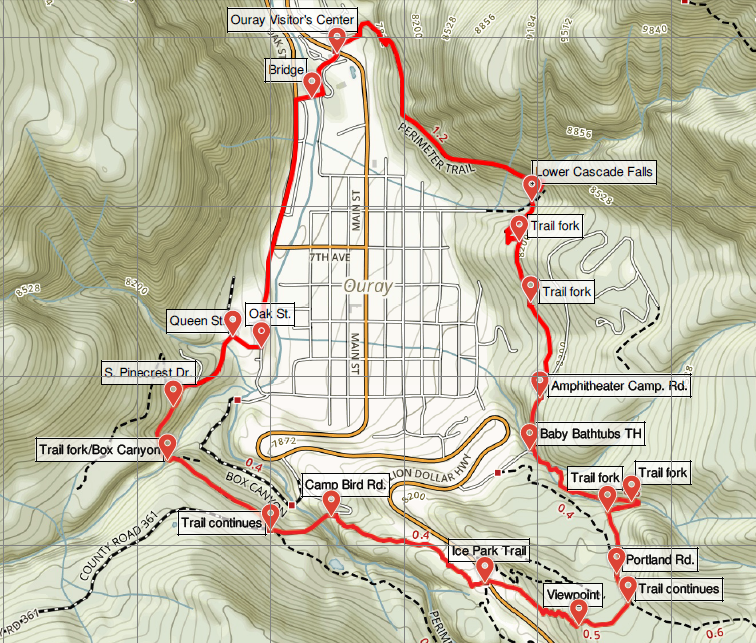 About 250 yards from the end of the Ice Park Trail, the Ouray Perimeter Trail continues again on the right. 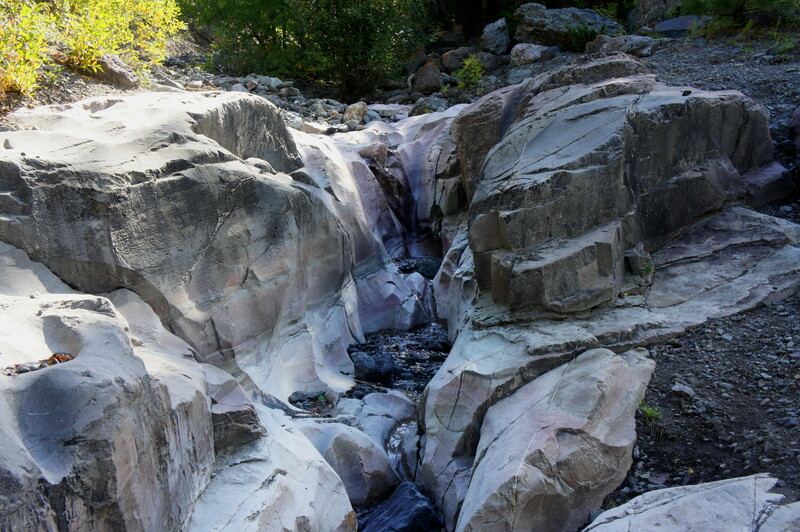 It’s a short, easy walk of 2/10 miles from here to Box Canyon Park, where the Perimeter Trail merges with the High Bridge Trail, a densely-crowded path that leads to a walkway over the deep canyon carved by Canyon Creek. 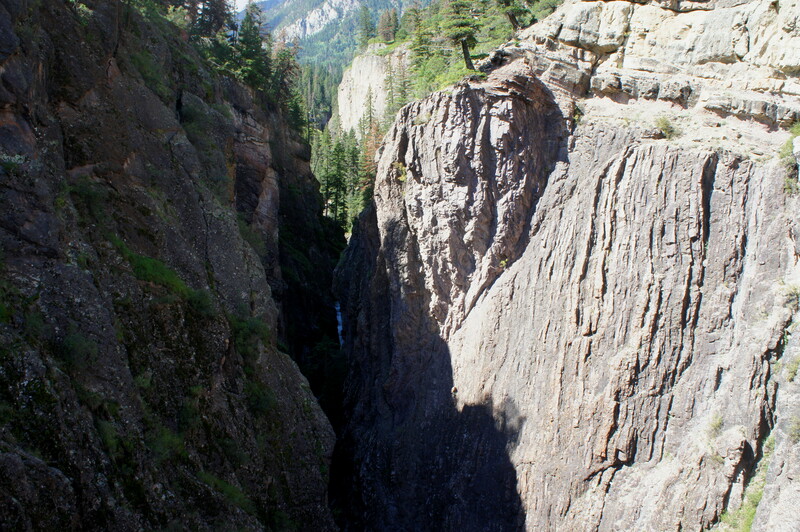 Composed mainly of charcoal-colored quartzite, the Box Canyon is deeper but arguably less interesting than the gorge crossed minutes earlier. Past the bridge, the trail passes through a low-hanging tunnel that was built for a water pipeline project in the early 20th century before it was abandoned in the 1950s. After exiting the dim-lit passage, descend a sharp slope with the assistance of a rope on the left. 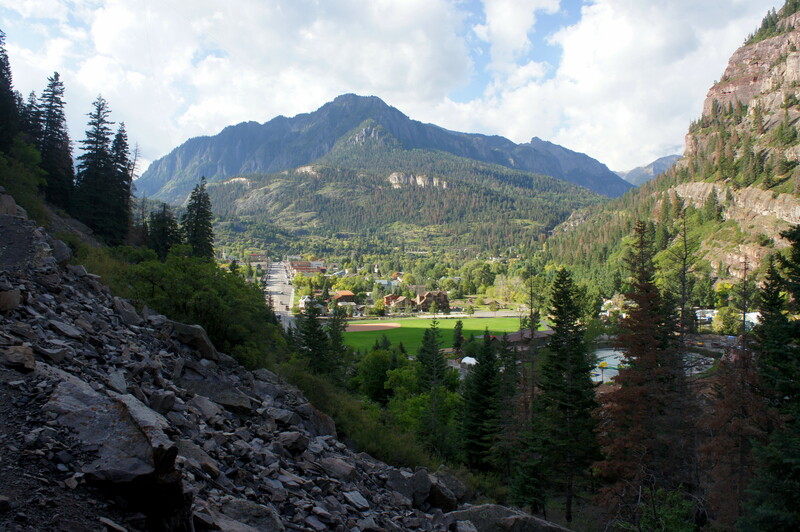 With views of the Box Canyon on the right, the trail drops to meet South Pinecrest Drive, marking the end of the unfinished Ouray Perimeter Trail at 3.25 miles. The remainder of the circuit consists of road walking, beginning with a downhill stroll on the unpaved but improved track of Pinecrest Drive. After crossing Oak Creek, take a left on Oak Street, a residential drive that parallels the Uncompahgre River as it heads northward. At 4.1 miles, take a right and cross the pedestrian bridge over the river; from here, it’s steps to the Visitor’s Center and parking lot where the hike began. 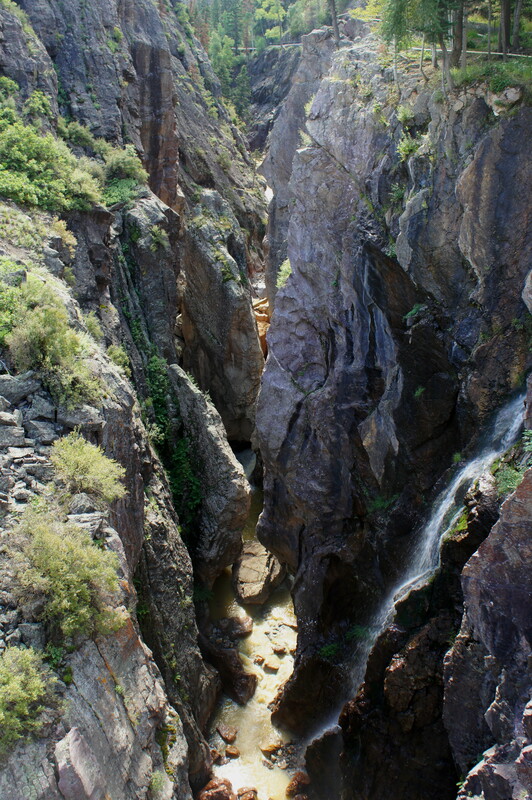 Allot at least two hours for this hike, which is probably best completed in late morning or early afternoon, before the evening shadows cast darkness over Ouray’s colorful canyons. This entry was posted in Colorado, Moderate Hikes, Uncompahgre National Forest and tagged Baby Bathtubs, box canyon, canyon, Colorado, Hayden Mountain, High Bridge, loop hike, Lower Cascade Falls, Ouray, Ouray Perimeter Trail, Uncompahgre Gorge, Uncompahgre National Forest, waterfall. Bookmark the permalink.